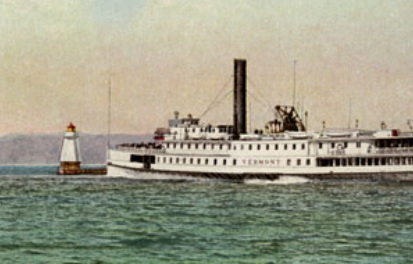 In the 1800s, one of the most prosperous communities along the eastern shore of Lake Champlain was Burlington, Vermont. The lake became a major shipping route after the establishment of canals connecting it to the Hudson River, the Great Lakes, and north to the St. Lawrence River. Burlington grew into the third-largest lumber port in the nation, and two reconstructed lighthouses on the city's waterfront now serve as reminders of the city's illustrious past. Burlington's harbor was ideally situated, but it was exposed to strong winds from the northwest and the south. In an effort to protect the harbor, a granite breakwater was constructed beginning in the 1830s. It was one of five federal breakwaters eventually built on the lake. By 1896, the breakwater reached 4,200 feet in length. Above right: This detail from an 1858 illustration shows the Burlington Breakwater South Light that has been newly replicated. In 1857, navigational lights were added to the north and south ends of the breakwater. The small lighthouses were moved and rebuilt multiple times as the breakwater was expanded, and a middle light was added for a time beginning in 1890. The wooden towers were plagued by ice, fire and wind; the North Light burned in 1870, and in 1876 the South Light was knocked over in a storm. The lights were attended by keepers who lived nearby and reached the towers by boat, a dicey proposition in rough weather. A keeper's residence was added to the breakwater in 1875 and remained for about a decade, but it was never used. An 1884 letter indicated that it was in bad condition, and that there was concern that it could be destroyed in a bad storm.The house was eventually sold and moved to a neighborhood in Burlington, where it still remains as a private residence. One evening in 1938, 75 people in 12 boats escorted Keeper Rolla W. Hill back to shore on his last night of manually lighting the lights. Automatic operation of the lights began the next night, powered by acetylene gas. The lights were converted to electric operation in May 1941. Eventually all the lights on the breakwater were replaced by modern steel skeleton towers. The breakwater, which is on the National Register of Historic Places, has been rehabilitated in recent years. 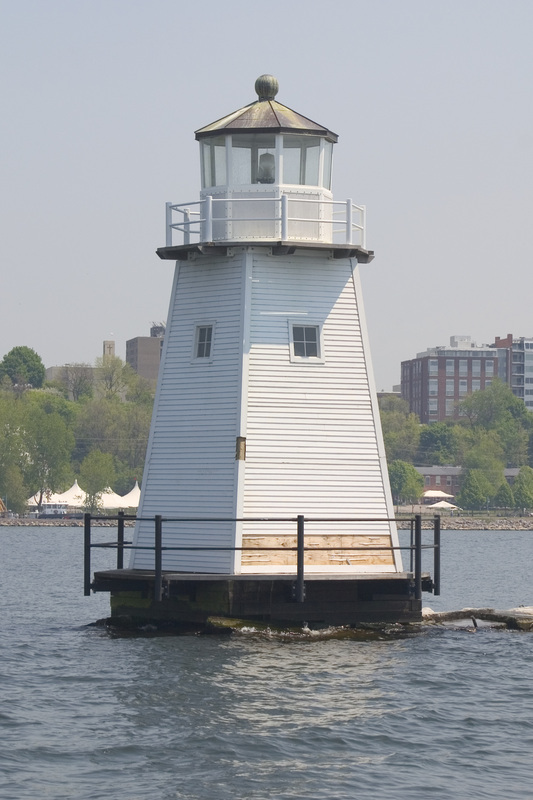 "Given the historic significance of the breakwater," said Burlington's Mayor Peter Clavelle, "we came up with the idea of recreating the original lighthouse structures, and approached Senator Patrick Leahy's office about the possibility of creating the replicas." $250,000 in funding was secured with Senator Leahy's help, and a piece of history was brought back with the construction of new wooden lighthouses. According to Art Cohn, director of the Lake Champlain Maritime Museum, the original plans for the lighthouses couldn't be located. "What we did," he said, "was use photographic evidence to create a set of plans that from the outside seem historically correct, and of course we chose two different time periods to represent -- the smaller, southern light tower, which is circa 1857, and the larger, northern light tower which is circa 1890. We worked with the photographs and other historical images to ensure that people seeing the towers today would be actually viewing the same façade that they would have seen during those time periods." The new wooden structures were built by Atlantic Mechanical, Inc. of Wiscasset, Maine under contract to the U.S. Coast Guard Civil Engineering Unit in Providence, Rhode Island. Construction took place on the Burlington waterfront to allow public viewing of the process. Larry Paul, project manager for Atlantic Mechanical, agreed with the philosophy behind the building of the new towers, saying, "The aesthetics [of a lighthouse] are so much more pleasing than your generic steel tower with a light on it." Unlike the original lighthouses, the new ones are strengthened with steel frames, and their wood siding is made up of easily replaceable panels. The 46-foot North Light is located near the city's new fishing pier, and the 26-foot South Light is close to Perkins Pier. The replica lighthouses have replaced the skeleton towers as aids to navigation. The Coast Guard project officer was Lieutenant Commander Will Smith. Other partners on the project included the Burlington Economic Development Office, U.S. Coast Guard Station Burlington, U.S. Army Corps of Engineers, Lake Champlain Maritime Museum, Preservation Trust of Vermont, the Lake Champlain Basin Program, the Vermont Division for Historic Preservation, and the Burlington Department of Parks and Recreation. The lighthouses represent the culmination of two decades of improvements to the waterfront. Not too many years ago, petroleum tanks and other industrial sites dominated the area. Local citizens now enjoy a world-class Waterfront Park and Promenade, a Community Boathouse, Community Sailing Center, the ECHO Center museum and aquarium, over 40 acres of open space near the water, and a seven-mile bike path. Each year thousands of people attend events on the waterfront. The new lighthouses were dedicated and lighted at a public ceremony on the evening of September 12, 2003. After being entertained by the Vermont folk music of Atlantic Crossing, the crowd of more than 150 listened to the first speaker and MC, Art Cohn of the Lake Champlain Maritime Museum. Cohn expressed his deep appreciation to all involved with the revitalization of the waterfront area, the rehabilitation of the breakwater, and the creation of the new lighthouses. Mayor Clavelle then addressed the crowd, followed by James Steudle, Officer in Charge of Coast Guard Station Burlington, located just a short distance away on the waterfront. 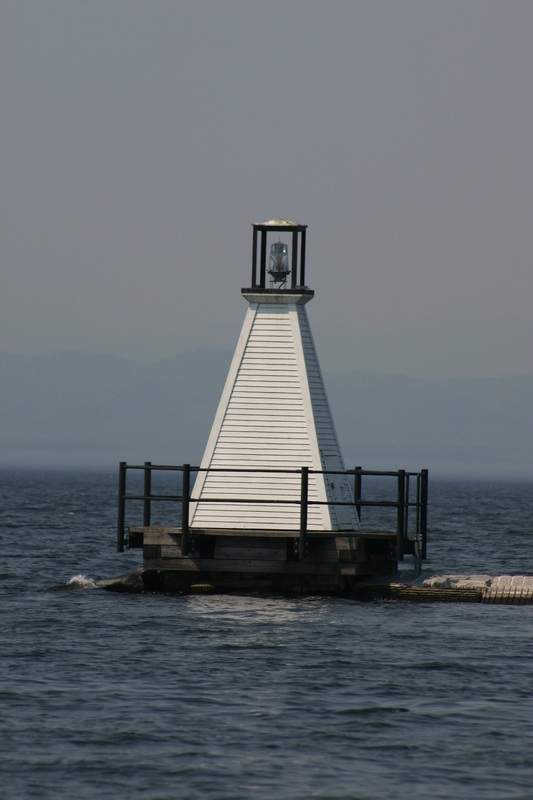 The station's primary mission is search and rescue, but the station's aids to navigation team looks after more than 140 buoys, lights and markers on Lake Champlain. Larry Paul of Atlantic Mechanical and then Vermont Senator Patrick Leahy addressed the crowd. At 7:35 p.m. everyone counted down and the South Light was activated. Seconds later, a flare went up from the North Light and it then began to flash.